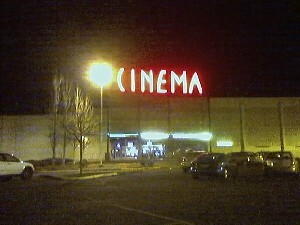 I think the first movie I saw at the Westgate Cinema in Beaverton was Star Wars. That would be the original Star Wars, before there were any others. The hype for that movie was amazing. I saw it on opening day with my former college roommate who was in town for a visit. I remember a helicopter landing in the middle of the parking lot — an area was roped off, the rest of the lot was full — and out came actors playing the Star Wars characters. Darth Vader walked up to me in line, breathed heavily, and said, “Acme Respirator Service.” Leia and Chewy walked up and down the aisles looking for seats. Han and Obi Wan may have been there also. My memory is, alas, imperfect. But when was the last time you went to a movie opening night like that? Today I decided not much was happening and a movie was in order. I’ve been wanting to see Serenity. I’m a newly minted Firefly fan. I’m sorry I missed the show when it was first on, and sorry that it was cancelled. I wanted to see the movie. I looked up times and places, and the closest was the Westgate. I’ve always liked the Westgate, even before the big remodeling. It has character, and so many of the newer theater complexes don’t. I was sorry to see it fall on hard times, and sorrier that it never picked back up. I knew that a new theater had opened just a few blocks away, and figured that had sounded the death knell for the Westgate. But I didn’t realize it would be so soon. I guess I’m sadly out of the theater opening and closing loop, because I didn’t have a clue that it was today. At the Westgate I didn’t have any problem finding a parking place. There weren’t more than 10 cars in the whole lot. As I walked up to the ticket office, a guy ran out from inside and stuck a camera in my face. “Do you mind if I talk to you for a minute?” He asked. “Why?” I said. I’m not really all that newsworthy, myself, you know. Wishing that I’d maybe combed my hair a little better, I blathered something about always liking the Westgate, and wasn’t Star Wars fun, and how sad that no theaters have character any more. And then I escaped to the ticket booth. The gal selling tickets was in tears. The kids selling snacks were likewise sober. I heard one ask the manager to please let him stay until the theater closed. Serenity? It was OK. Not the best of its genre, but certainly true to the Firefly ‘verse. It seems somehow fitting that both the first and last movies I saw in the Westgate were sci-fi. I wish more people had been there. Goodbye Westgate. I will miss you.